Drawing Theatre, live digital arts and sound scapes, DJ’s, cabaret and YOU! 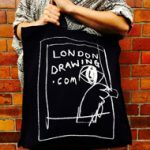 Join Kiss My Art and London Drawing for a new explosion of creativity in The Vaults incredible subterranean tunnels under Waterloo Station. Vote for your favourite artist as we whittle 10 down to one winner while Kiss My Art and London Drawing collide to create art as spectator sport in one of the most exciting spaces in London. London Drawing will create epic performance art, sound and light installations for the Kiss My Art competitors to respond to in a thrilling fusion of art, performance, fashion and music.